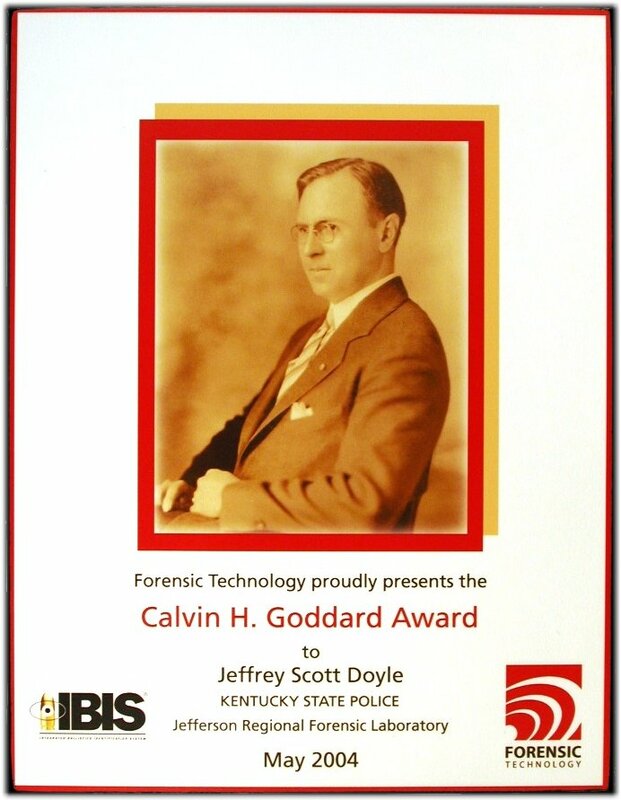 On May 27, 2004, while attending the Association of Firearm and Tool Mark Examiners Training Seminar, I was presented with the 2004 Calvin H. Goddard Award* by Forensic Technologies, Inc (FTI). See brochure. Never in a million years would I have thought that I would win any award much less one dedicated to the forefather of Firearm Identification! I want to take this opportunity to thank FTI and the selection committee for considering me worthy of this unbelievable award. I am truly humbled by the entire experience. I also want to especially thank Erik Dahlberg. Erik actually nominated me for this award but Erik has contributed so much of his time in helping me with this website that I feel the plaque should really bear his name! Without Erik's help this website would not be anything near what it has evolved into today. Thank you Erik for being such a good friend to me and to the field of Firearm Identification! Lastly, I want to thank all of the Firearm Examiners in the world who on a day-to-day basis are working for the pursuit of truth and justice through science. This site is dedicated to you and to the discipline we hold so dear to our hearts! * The award, named after the man widely regarded as having inaugurated the science of firearms identification, is to honor the men and women in law enforcement who have demonstrated excellence in their field through sustained superior performance, an exceptional case, the implementation of best practices, or some other interesting or unique method. 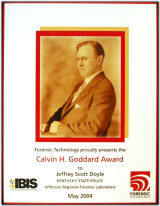 To learn more about Col. Calvin H. Goddard and this award visit www.goddardaward.com.